Water meadows must be among the most misunderstood pieces of the agricultural landscape. Years ago, I remember having flood pasture pointed out to me as a good example of water meadow, by an ‘expert’ who would have known better had he only done a tiny little bit more reading. To be fair to the man, prior to the publication of Mark Everard’s book, there was something of an information vacuum on water meadows, which are a sophisticated system designed to bring forward and maximise grass production. The basic idea is to ‘float’ the fields in question so that the grass is insulated from winter cold by a constantly moving layer of water, the level of which is fine-tuned by a system of sluices and hatches. The immediate benefit of this labour-intensive system was better quality spring grass, which relieved livestock farmers of the problem of feeding animals in March/April when hay stocks were running out, but insufficient grass was available to feed their beasts. The problem was building water meadows was expensive and even at their peak in the nineteenth century, no more than 100,000 acres were available. The problem with water meadows, idyllic though their decaying remains are to our eyes, and strong though their association with fishing might be, is that they are a relatively hostile environment as far as wildlife is concerned. 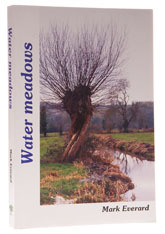 After a thorough explanation of the history and workings of water meadows, a clutch of chapters deals with their effects on birds, mammals, fish and reptiles, the central theme of which is that it is a good thing that finances and topography prevented more water meadows being built. A surprising conclusion, but backed up by solid evidence as it is, Mark Everard has left me looking at these remarkable creations in a completely different light.